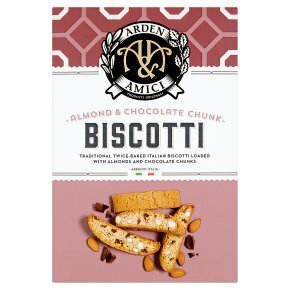 Traditional Twice-Baked Italian Biscotti Loaded with Almonds and Chocolate Chunks. Suitable for vegetarians.La Dolce Vita Our twice-baked Biscotti are loaded with almonds for a characteristic nutty crunch, plus chocolate chunks for a little extra indulgence. The Italian way is to dip these in a glass of sweet dessert wine but they're also a great partner to a frothy cappuccino. Warning: Although extra care and attention has been taken to remove all pieces of nut shell, some may remain.